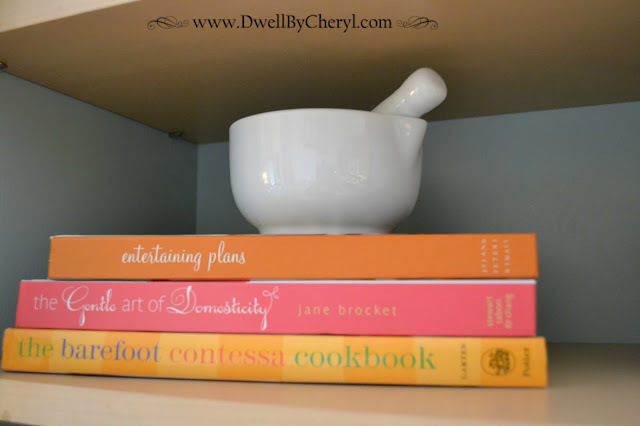 Dwell by Cheryl: Open Kitchen Cabinet Reveal! First off, I have to tell you that this blog post has been days in the making. I'll have to tell you the story a little later, but today I'm excited to reveal my new open kitchen cabinets. You know, sometimes I wonder why I don't just go with my gut when it comes to design and decor decisions. It seems that when I do, I'm rarely disappointed with the result. I mentioned in my first Open Kitchen Cabinets post that I've been contemplating the decision to ditch the door (or at least part of it) for some time now. However, it wasn't until last week that I finally decided to go for it. Best decision EVER! Minus a few mishaps, the process was fairly simple. I briefly mentioned Steps 1 (Removing the Door Panel) and 2 (Cleaning out the Cabinet) on my original post. The subsequent steps were also pretty easy. Step 3: Painting the Interior. Luckily, I had a little Olympic Blue Shamrock left over from my Craigslist Chair Makeover project. I highly recommend the two-in-one paints because it cuts the time in half, eliminating the need for multiple coats. Step 4: Styling the Shelves (a.k.a. The Fun Part) I spent the better part of Saturday having fun playing around with accessories. Surprisingly, I had everything I needed already, with the exception of two Boxwood balls that I picked up at Stein-Mart for $2.99 each. Step 5: Reattaching the Door- It was an interesting process, but after some work and ingenuity, I was able to insert and attach (with glue) my new glass pane to the existing cabinet door. I think this is definitely a case where having the right tools would've made all the difference. I'll tell you more about the process in a later post. So loving the results! Have a wonderful Independence Day!! Hi Cheryl! Such a beautiful kitchen! I love your open cabinets. Your accessories are spot on! So nice to connect with you on IG. Hope you are having a great week. Thanks Brandi! Great to connect with you too! Thanks Shavonda! I love it! Bonus: you're forced to declutter and stay organized. You are such an inspiration!!!! I have two glass cabinets and was thinking it was dated, but you've made me realized that I just need to update the dishes and accessories. Genius! Lovely!!! Nice holiday present for the home. Turned out great!! And you are right about forcing you to keep it neat and tidy. No more "freebie" coffee mugs in that cabinet ever again. Bye bye clutter. Hello gorgeous! Thanks everyone! I appreciate the great feedback. It really does make me happy everyday! I work with Cassity at Remodelaholic.com, and we'd love to have you come link up our Remodelaholics Anonymous linky party every weekend (Friday through Monday) for all types of home projects. We'd love to have you come share this or any of your other posts, too!